Composer John Adams, never one to shy away from challenging topics, takes on nothing less than worldwide, repressive patriarchy in his latest “dramatic symphony” for violin and orchestra, Scheherazade.2. 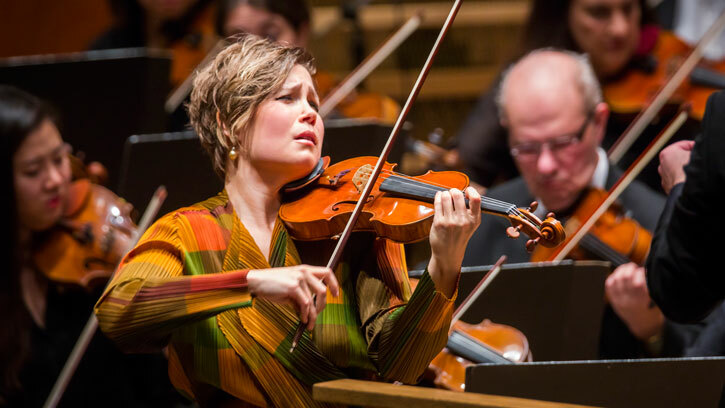 In this modern response to the ancient tales of The Arabian Nights, he has conjured a heroine for the ages, casting violin powerhouse Leila Josefowicz in the title role. When Adams conducts the West Coast premiere with the Seattle Symphony on March 17 and 19 and at Untuxed on March 18, it will be more than a marquis musical event — it will also stir up powerful and provocative questions about women in our world. Adams has been at the top of his field for three decades, since first gaining notice for his suave and expansive scores rooted in the minimalist techniques of Steve Reich and Philip Glass. There are still shades of those hypnotic, repeating cycles in Adams’ style, but his real mark has become the courage with which he applies his musical gifts to emotionally charged topics from the real world. He took on geopolitics in his first opera, Nixon in China, and his haunting memorial written after the September 11 terrorist attacks, On the Transmigration of Souls, earned him the Pulitzer Prize in 2003. His most controversial work, which triggered heated protests during a recent revival at the Metropolitan Opera, is The Death of Klinghoffer, an opera based on the true story of a Palestinian hijacking of a ship and the murder of a Jewish passenger. “Music is subversive,” Adams told The Telegraph in a recent interview. “It is much more able to change people’s behavior because it speaks to them on a subliminal level with emotional power.” In referencing the mythical Persian queen, Scheherazade.2 certainly addresses the Middle East’s history of persecution of women. But Adams has also made clear that this one representative story resonates with others closer to home, from sexual violence on college campuses to the misogyny facing a woman running for president. The journey of Scheherazade.2 first tracks “a beautiful young woman with grit and personal power” as she is pursued by “true believers.” For a love scene titled A Long Desire, Adams mused, “Who knows…perhaps her lover is also a woman?” Scheherazade and the Men with Beards plays out as a musical trial, the violinist rebutting the orchestra’s barking accusations. The thrilling final chapter represents “escape, flight and sanctuary” for the tireless heroine. In the abstract language of a symphony, Adams’ narrative is vivid and immediate while still staying open to personal interpretation. Whatever story you hear in the music, Scheherazade.2 challenges you to reconsider feminine strength, near and far. Reserve your tickets to hear Scheherazade.2 with John Adams and the Seattle Symphony on March 17 and 19 and at Untuxed on Friday, March 18.